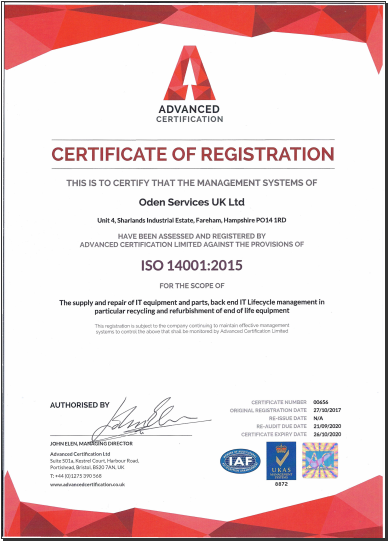 Oden Services UK Ltd is the South's foremost IT Recycling and IT Disposal company. Established for 11 years with branches in Hampshire and Somerset we are perfectly placed to provide an unrivaled, secure and compliant service. Our optimal recycling expertise makes us specialists in offering a compliant tailored service. We understand the significant challenges organisations face when disposing of their I.T estate and WEEE. Our flexible service provides maximum financial benefits whilst maintaining environmental compliance and data security. With clients forming a wide spectrum of activities we service may sectors including Financial institutions, Education, Utilities, Entertainment, Automotive and Retail to name a few. Contact us today to find out how we can assist you with your retired equipment. We aim to complete collection within 3 days. All data carrying devices are wiped using NCSC approved software or physically destroyed with our own shredders and punches. Full AATF site operation complete with secure client portal. The guys at Oden removed the stress we had. Disposing of our electronic items was an environmental and data protection mine field. They visited our site, carried out an audit and collected the same week. Every detail is on the portal for us. Great company to deal with. Quick clean service carried out by professional company. Lovely collection staff. Next day collection, all paperwork supplied. Perfect. Mobile destruction unit came to our site, the operator made a list of drives, drives were destroyed and taken away. Very satisfying to watch our drives being destroyed. Booking was easy and collection was carried out in a timely manner. Data erasure certificates were very detailed. Oden are a local company and have provided IT disposal services for us for 10 years, can't recommend enough.